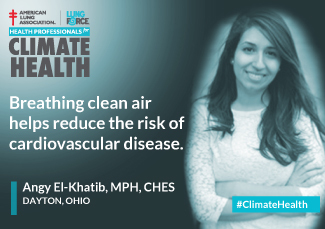 The American Lung Association in Ohio "Health Professionals for Climate Health" campaign highlights the medical and health community's strong support for clean air and climate policies. 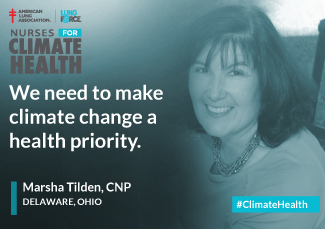 Climate change is one of the most serious public health challenges of our day. Scientists say that warmer temperatures can enhance the conditions for lethal air pollutants, including ozone and particle pollution, and increase the risk of unhealthy air in the United States. All people are entitled to breathe healthy air and to be free of the adverse health effects of air pollution. I am especially concerned about the effects of air pollution on the health of vulnerable populations, including children with asthma. 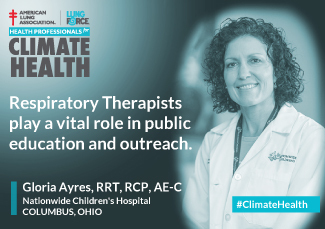 Respiratory therapists play a vital role in public education and outreach regarding efforts to reduce all emissions that contribute to climate change. For children to achieve their full potential, they need a safe and healthy environment in which they can grow and develop. The air that they breathe, the water that they drink, and the food that they eat is critical to that growth and development. 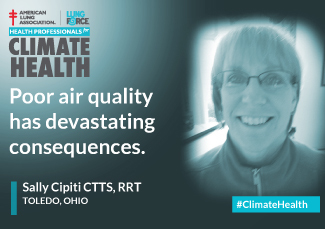 As a Nurse Practitioner I work with some of our most vulnerable elders with underlying lung conditions like COPD and asthma, so I witness the effects of climate change firsthand. That's part of why I installed solar photovoltaic panels on my home, drive a hybrid, and founded a non-profit dedicated to human and environmental health. I would invite all of my colleagues to do their part and help to build a more resilient health care system founded on the fact that human and environmental health are inextricably intertwined. The reality is that breathing is becoming more difficult for older adults and children with asthma. President Obama has made it clear, there is no Planet B we can go to. It is each person's responsibility to make the change towards a cleaner environment. Climate change is not something that may happen in the future – it is here and it is happening right now! Climate change deniers in point to the last two winters of extreme cold temperatures in the Midwest and Northeast as evidence to support their viewpoint. However, increased frequency of extreme weather conditions is one of the results of climate change. This can be illustrated at the local level by the increased frequency of torrential downpour episodes in Northeast Ohio over the last several years resulting in increased episodes of flooding. 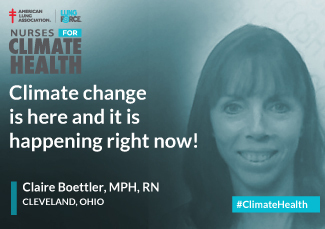 As a public health nurse I am very concerned about the health effects of climate change, especially in my own backyard of Northeast Ohio. 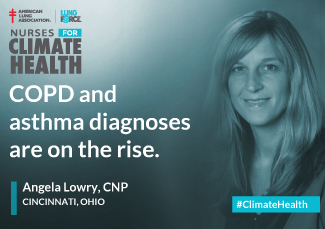 Childhood asthma and new onset of adult asthma continue to be major public health issues in Northeast Ohio and the extreme weather conditions resulting from climate change accentuate the environmental conditions that contribute to asthma flare-ups (e.g. mold due to flooding, longer allergy season, etc.). Collectively we can slow the rate of climate change and mitigate further health consequences by supporting legislation, policies, and funding for renewable and clean energy sources and urging our federal and state representatives and senators to support and comply with the Clean Power Plan recently released by the federal EPA. As a pediatrician, I am dedicated to ensuring a healthy future for all children. Climate change poses serious health threats that disproportionately impact children: from extreme weather events, to increased air pollution, to changing patterns of infectious disease. It is our responsibility to act on behalf of current and future generations of children to reduce the impacts of climate change. Fortunately, actions such as reducing our reliance on fossil fuels, designing walkable cities, and investing in more sustainable food systems have multiple benefits for our economy and communities' health and well-being. 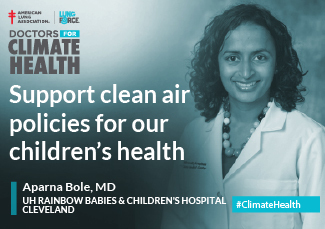 I invite my fellow health professionals, and those who care as deeply as I do about children's health, to join me in supporting policies and practices that result in cleaner air, stewardship of natural resources, and vibrant communities. 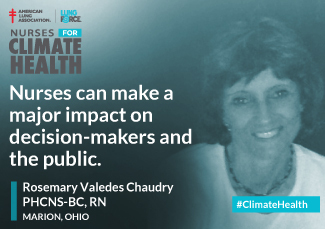 Climate change has been called the most serious public health challenge of this century. Climate change is happening right now-- we see the effects in increasingly warmer climate and extreme heat, extreme flooding, increasing levels of pollutants in our air, widespread drought, and increasing wildfires. These catastrophic events effect everyone, but climate change is clearly an issue of health and equity- because of the differential impact on vulnerable populations including children, older adults, and people living in poverty. There are things we can do right now to address climate change and protect our air, our environment, our communities, and our health. 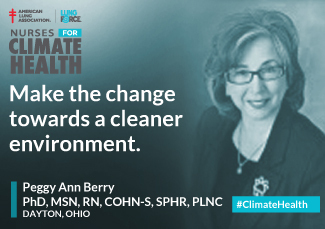 Nurses can make a major impact on decision-makers and the public if we work together to advocate for policies and practices that increase awareness and promote clean air, safe and sustainable energy, and healthy environments. Having a career in Respiratory Therapy and working as a Tobacco Treatment Specialist, I have witnessed the effects from exposure to all forms smoke. Poor air quality has had devastating consequences for millions of people. Climate change has a direct impact on the air we breathe. To reduce pollutants and exposure to toxic substances is a Global responsibility that begins with individual changes. By working individually and globally, we can ensure a safer cleaner future for ourselves and for future generations. Air pollution is a major risk factor for heart attacks and stroke, especially among individuals with diabetes. Eating a healthy diet and getting regular exercise is just as important as breathing clean air for reducing the risk of cardiovascular disease. Doctors see the results of air pollution manifested as asthma and chronic lung disease daily. 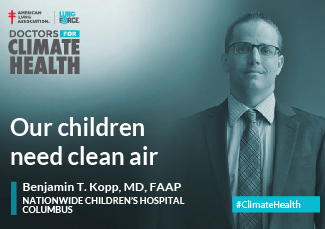 They treat patients of all ages who are innocent victims of the fouling of our air with fossil fuel emissions, the same emissions which are causing our planet to heat up. We must act to slow down this process and clean up our air. Climate change affects everyone's ability to safely and comfortably breathe, but especially our children who are most sensitive to changes in air quality and rapidly fluctuating temperatures. 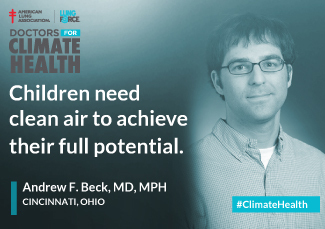 Climate change is already significantly impacting and increasing chronic lung diseases in children, and we haven't even seen severe climate changes yet. I ask you to join me in efforts to protect our environment while there is still hope for our children. 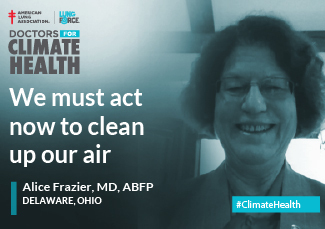 As a Nurse Practitioner that specializes in Pulmonary Medicine, I see the devastating effects of poor air quality on the health of our young adults and elderly on a daily basis. COPD and Asthma diagnoses are on the rise. 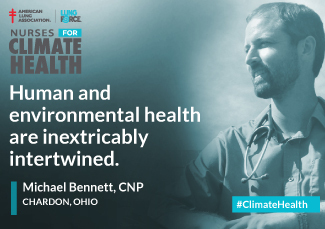 We cannot afford to ignore the negative health impacts from climate change any longer. 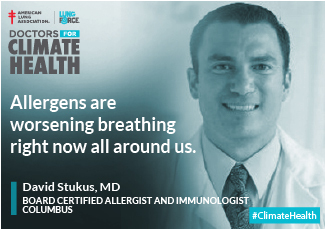 Changes in our climate have had dramatic effects on outdoor allergens, which affect millions of people with asthma. Almost every year, we are experiencing longer and more intense pollen seasons, which can worsen breathing both rapidly and long term. This isn't something you just read about in the news or see on television, this is happening right now all around us. The effects of climate change that I have seen in recent years includes extreme weather changes such as storms, flooding, and high winds that can affect water and food supplies, power lines and communication and access to medical care; warmer temperatures that can lead to heat waves and more heat related illness and death and many more days of poor air quality which can affect the young, elderly and those with lung related diseases very poorly. Even though the US has a developed healthcare system, these changes will impact many Americans adversely and we as a community need to make climate change a health priority.